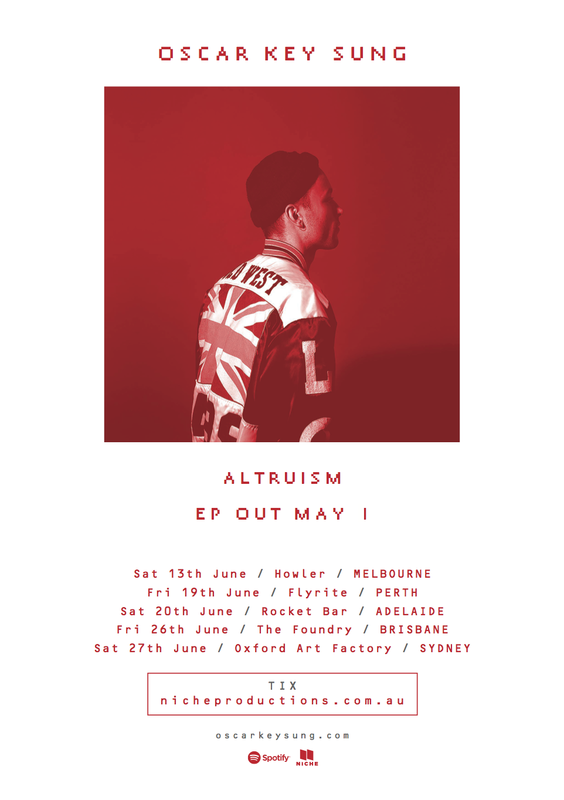 One of Australia’s most unique producers and Melbourne’s most vital voices, Oscar Key Sung will release his second EP, Altruism on May 1 and in celebration will be hitting the road this June. The EP features lead track Premonition and new single Skip, available now as an instant grat when you pre-order the EP. Altruism further explores the ever-growing polarity in Key Sung’s sound. His sound winds simultaneously through RnB’s golden past and pop’s near future. The signatures of Key Sung— its panoptic production and lyrical exposition— are underscored on Altruism, deepening his sense of conflict; its glacial beauty and modern dread. “I always wanted to make more hi-fidelity music, for clubs, rooms dedicated to listening and movement” he adds. After being handpicked by Mercury Music Prize-nominated MC Ghostpoet and MeLo-X for their MELOGHOST project, collaborating with Andras, Banoffee, Cassius Select and touring clubs and festivals in Europe, Japan and the US, he’s been doing just that. Catch Key Sung touring nationally in June.